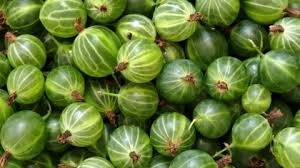 Gooseberry Hinnonmaki Green £5.50 - Soft Fruit - Gooseberries and Jostaberries Apple Trees and Fruit Trees For Sale. Buy at competitive prices with wholesale discounts. The 'Hinnonmaki Green' is a hardy gooseberry bush with excellent disease resistant properties. The berries are large, green coloured and sweet. Excellent for tarts, pies, crumble and jam.